Labor Day for many of us announces the end of summer. Though the Autumnal equinox (equal day and night hours) doesn’t happen until September 22nd this year when we begin to get the first inklings of seasonal change. Kids have generally started school. It’s usually still pretty hot out so the grill becomes the choice for most cooks since you don’t have to heat up the house by using the oven. Here is a sampling of some of my favorite recipes to celebrate Labor Day and the nearing end of harvest. Add vinegar, water, sugar, fennel, salt, garlic and curry to a small saucepan and bring to a boil. Add corn, red pepper and red onion and bring back to a simmer, about 2 minutes. Place mixture into a clean glass jar then cover and refrigerate for up to 6 weeks. This depends on having dead ripe heirloom tomatoes and ripe sweet watermelon which means it’s a summer salad. 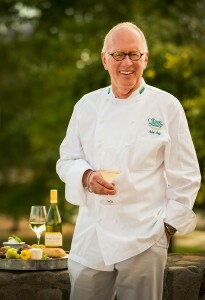 I like the golden balsamic vinegar from Sparrow Lane in the Napa Valley www.sparrowlane.com. Combine the watermelon, tomatoes and mint in a mixing bowl. Whisk the olive oil and vinegar together and season to your taste with salt and pepper. Transfer the tomato mixture to a serving plate or bowl. Drizzle the vinegar mixture over the salad and top with the feta and pine nuts. Serve immediately. Whatever wonderful vegetables you find in the garden or at your farmer’s market can be used in this dish. Feel free to substitute and experiment! Toss the tomatoes, 1/4 cup olive oil, salt and pepper to taste together in a large bowl. Whack the garlic with the side of a knife and toss it into the bowl. Let marinate at room temperature, tossing once or twice, for 30 minutes. While the tomatoes are marinating, place remaining cut vegetables in a large shallow bowl, add the remaining 1/4 olive oil, and toss to coat. Season generously with salt and pepper. Place the vegetables on a medium hot grill and cook for 6 to 7 minutes until they are crisp tender and nicely marked. Be sure to turn halfway through the cooking time. Transfer vegetables to a cutting board and chop attractively. Remove the garlic from the tomatoes and add the chopped vegetables to the tomatoes. Stir in oregano, parsley and mint, season to your taste with salt and pepper and drizzle with additional olive oil if desired. Can be made a day ahead and refrigerated. Serve at room temperature. My favorite way to cook lobster is to do it on the grill. The shells char as the meat cooks giving the lobster a delicious flavor. Before splitting the lobster it can be humanely killed by inserting a knife decisively at the top of the head where it joins the body. This presumably severs the spinal cord dispatching it instantly. Alternately it can be dispatched by plunging in boiling water for 2 minutes. Unfortunately, we don’t know which is preferable to the lobster! Split the lobsters in half lengthwise and gently crack the claws. Remove and discard the long thin intestinal tract that runs the length of the lobster and also the lumpy head sac that is located near the eyes. Prepare a two level fire, brush the shell and tail meat with oil and season with salt and pepper. Place shell side down directly over medium coals. Liberally brush the softened compound butter, working some of it into the cracked claws. Repeat this again in a couple of minutes. Shell at this point should begin to char a bit. Move the lobster to a cooler spot on the grill if necessary and cover lobster with a metal roasting pan. Cook for 4 – 5 minutes more or until meat is just cooked through. Serve with additional butter and lemon wedges to squeeze over. Beat together the softened butter, zest, juice, thyme, chives, salt and pepper in a small bowl. Scoop out onto waxed paper or plastic wrap and form into a sausage shape about 3/4 inch in diameter. Store refrigerated for up to 3 days or wrapped tightly in foil and frozen for up to 3 months. Allow to soften to serve. In a small saucepan combine the ingredients for the grill sauce and simmer until thickened, about 6 minutes. Off heat and whisk to combine into a smooth sauce. Brush or dip fruits in sauce and then quickly grill over medium hot coals until nicely marked, about 2 minutes total. Remove and slice fruit boldly. Arrange the grilled fruit attractively in shallow soup plates. Spoon custard sauce around and scatter berries over top. Serve post haste! This is sauce also is a marvelous base for ice cream. Simply add the cooled sauce to an ice cream freezer and follow manufacturer’s instructions. Remember that there are many varieties of mint available and each will have its own unique flavor. I love chocolate mint for this sauce. In a bowl, whisk the sugar and egg yolks together until light and sugar is dissolved. In a small saucepan scald cream with mint leaves. Off heat, beat cream mixture into egg mixture slowly. Return mixture to saucepan and cook over moderate heat, stirring constantly, until sauce just begins to thicken. Be careful not to cook too long or egg will scramble. Immediately strain discarding leaves and refrigerate.